Simplicity and elegance all wrapped up in one. 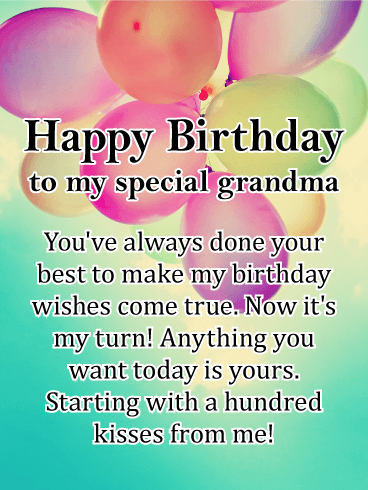 That is a good description for this birthday greeting and for your grandmother! She's a fine lady and she deserves to know how much you care. 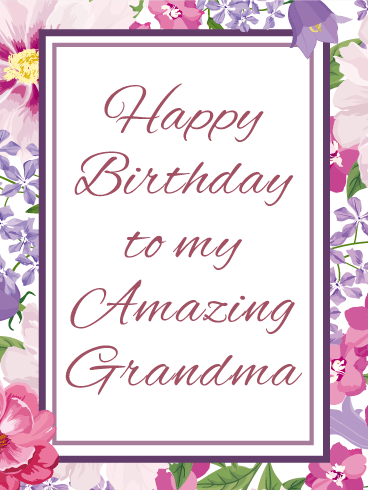 Send your grandma this thoughtful birthday card that boasts an attractive lavender hue with pretty white scrolling. It's just right for a fabulous grandma like yours. 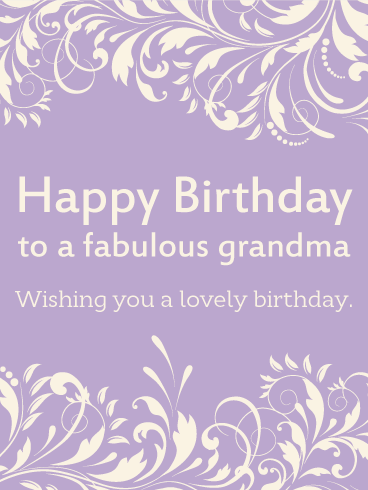 Happy Birthday to a fabulous grandma - Wishing you a lovely birthday. No one can quite compare to a grandmother. They know all the tricks in the book, but still let kids get away with them. Grandmas are also well practiced in setting kids on their feet and preparing them to tackle the world. Your grandma has supported you in every way possible. Wish her a birthday full of love and let her know how wonderful it has been to spend time with her. While your parents may see Grandma as someone who spoils you, you know the truth. Grandma is a wish maker. Wish for something, and your grandma will make it so. From watching TV on a school night to making your favorite dinner, your grandma makes all your wishes come true. 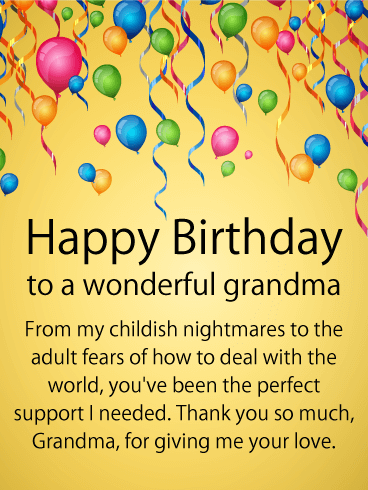 Turn the tables by granting all of your grandma's birthday wishes. Start by sending this card to let her know how special she is! Your Nana is like no other. So don't send her a birthday card like any other! 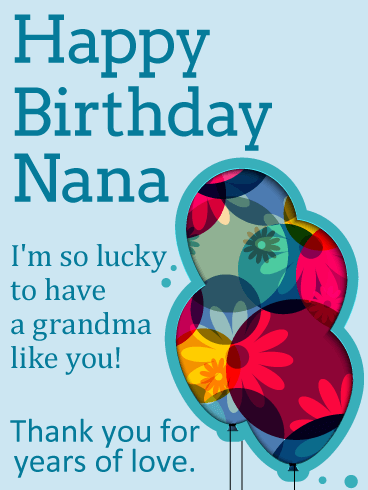 This very special grandmother's birthday card is lovely and sweet-just like your Nana! Thank your grandmother for all the years of love she has showered on you, and tell her just how lucky you are to have her in your life. Funky daisies float in the birthday balloons and make this a very modern and attractive birthday card for your hip and awesome grandma. Birthdays are pampering days. Laze about. Have attention lavished on you. Receive gifts. Do only what you want, even if its just to roll up in a blanket and read. Be spoiled, or spoil yourself. Birthdays are all about the birthday person, after all. 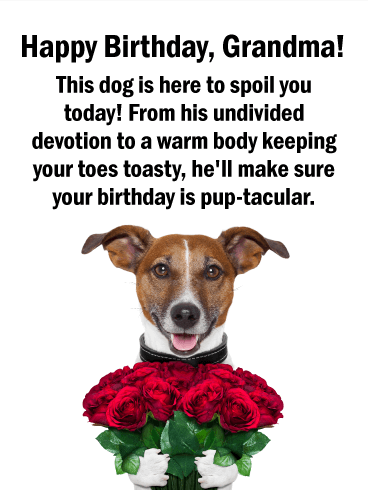 Help your grandma treat herself to a great birthday with this adorable puppy and a dozen roses. She deserves nothing less. The simple things often mean the most. Grandmas know that very well, and they appreciate the smallest gestures of love and thoughtfulness. 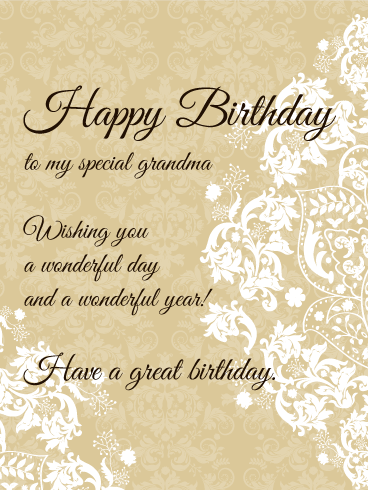 Send your grandma a beautiful birthday card to wish her a wonderful day. 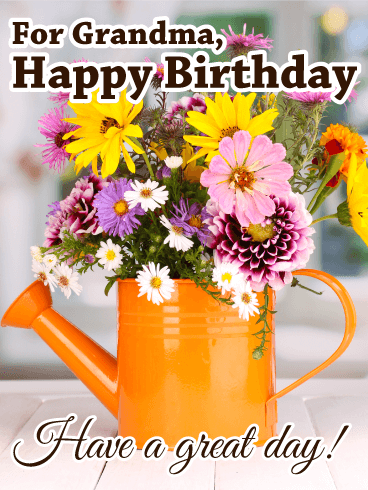 The fresh garden flowers on this birthday card look stunning in the orange watering can. They remind of us of fresh air, sunshine, vitality, and the good, good earth. Your grandmother will love this thoughtful birthday greeting. Grandma will probably tell you... one of the greatest joys of her life has been getting to watch her children and grandchildren grow into amazing and unique individuals. So she will no doubt appreciate the lovely butterfly gracing this birthday card, as it is representative of the beautiful family she's helped make. Grandma has always been the one you could turn to for a patient ear, a kind word, a loving hug, and reassurance that everything will be all right. 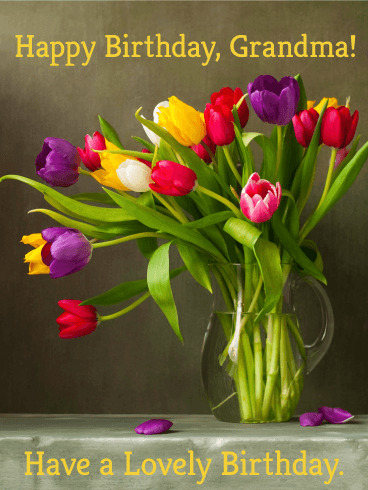 This beautiful tulip birthday card is the perfect way, and her birthday is the perfect time, to let her know how much all that has meant to you! Your grandma might be getting old, but she's never been someone to turn down a good party. Always eager to socialize, she's often the highlight of any event she attends. And at her own birthday party? Well, she's unforgettable. 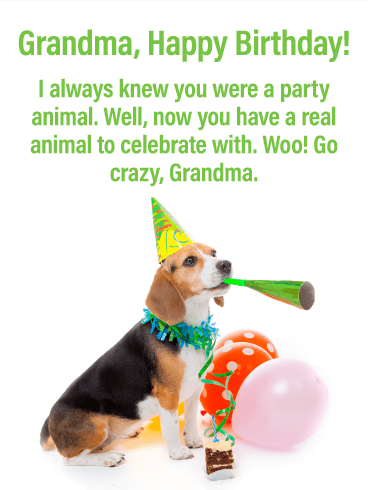 Make sure your grandma always remembers her birthday by sending her this fun card! It's sure to get the party started. Grandma is pretty fantastic, and she needs to have birthday that's just as fantastic as she is! It sounds like a tall order, but it's actually easier than you think to make it happen. Step 1 - Select this beautiful birthday card. Step 2 - Write a message, telling Grandma exactly how much she means to you. Fantastic birthday for a fantastic lady... done! Old-fashioned elegance for your amazing grandma. 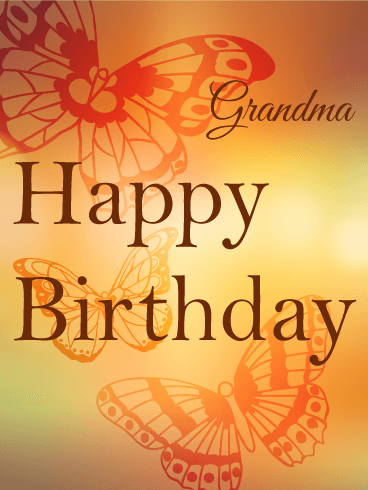 This beautiful birthday card will warm your grandmother's heart on her birthday. It is a thoughtful way to send love across the miles and to celebrate all the wonderful years of her life. 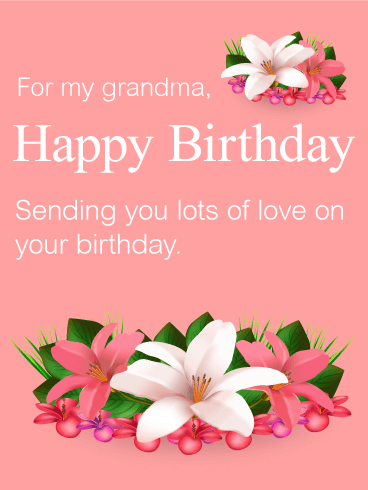 Your grandmother will adore the purple and pink flowers that adorn the border of this birthday card, and appreciate the warm birthday message. Your Grandma has always been a special lady. She has always been an inspiration to you and those around you, and persevered even the hardest times with strength and grace. And this elegant and lovely birthday card perfectly reflects the same elegant and lovely nature she's shown. 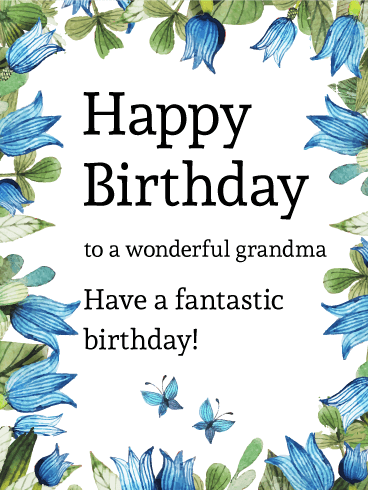 What a gorgeous birthday card this would be to give Grandma on her special day, even if you can't be there to see her in person. You know that she loves flowers, of course, but even more, she will be tickled pink to read the words of love you write for her!